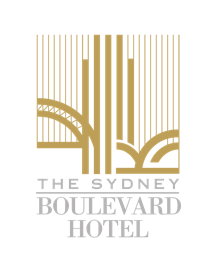 In the vibrant heart of the city, The Sydney Boulevard Hotel combines modern elegance with a highly sought-after location near the central business district. Generously sized accommodation offers FREE high-speed Wi-Fi and views of Sydney’s sparkling harbour or city skyline. Spacious suites provide a haven for families, while our Presidential Suite is known for its illustrious history of hosting celebrity guests. Within easy reach of city sights, you can enjoy a leisurely stroll through the leafy Royal Botanic Garden to iconic Sydney Opera House for views of the harbour, spanned by the striking Sydney Harbour Bridge. Stylish event spaces ranging from light-filled boardrooms to the Pillarless Grand Ballroom and a city-view sun deck, can comfortably cater for meetings, conferences and distinguished social events. The refined Twenty Five function room, with its uninterrupted views over Sydney Harbour, makes a superb wedding venue. Guests can savour our Western and Asian menu at The Vard Restaurant, while Seasons Cafe will delight your appetite with its breakfast buffet. Room service is available 24 hours. After a busy day of sightseeing or meetings, you can work out in our fully equipped gym while taking in sweeping city views, or unwind in the hotel’s traditional wooden sauna and modern steam room. Getting to the hotel couldn’t be easier. The 20-minute drive to Sydney International Airport is a breeze, with the Eastern Distributor motorway only moments away. Secure on-site parking is offered at the special rate of AUD 25 per day. Four train stations, including St James and Kings Cross, are within a 10-minute walk of the hotel. The neighbouring suburbs of Woolloomooloo, Potts Point and Surry Hills are home to a plethora of hip Sydney bars and restaurants. For a night out, you can head a few blocks up William Street towards the iconic Coca-Cola sign to sample Sydney nightlife in exuberant Kings Cross. Travelling with kids? You’ll find dozens of family-friendly restaurants within a 5-minute walk of the hotel, while Chinatown and the seafood restaurants of Darling Harbour are 10 minutes away by car.